This is a guest post by Jennifer Brundage, a National Outreach Manager for Smithsonian Affiliations and a Lemelson Center Advisory Committee member. Location, location, location. It’s important for real estate as we all know, but as I’m learning, also critical for innovation and invention. Golden, CO, (“Where the West Lives”!) is situated near the junction of I-70, the highway that leads straight to the Rocky Mountains and the ski resorts (and former mining towns) for which Colorado is so famous. It’s also only 15 miles west of Denver, enough to be close, but not too close, to major transportation lines. During the Gold Rush, Golden quickly became an ideal stopping point between the capital city and the mining industry. In fact, in 1858, David King Wall, Golden’s first resident, innovated a way to divert the pristine mountain water from Clear Creek to irrigate crops of vegetables, providing much-desired fresh produce for city dwellers and miners alike. The access to this same pure water also attracted Golden’s most famous resident, Adolph Coors in 1873. As the Places of Invention project repeatedly shows, when access to natural resources, business opportunities, and intellectual capital come together, they create a magnet for even more innovation over time. Golden is no exception. Soon, the Colorado School of Mines started attracting engineers to the town, and mountaineers discovered its benefits as well. View of the Made in Golden exhibition, showing a diorama of the town from 1938-39, and a list of reasons why over 150 manufacturing businesses call Golden home. This legacy of invention, stretching into the present day, is the subject of an enlightening exhibition currently on view at the Golden History Center, entitled Made in Golden. After establishing the primacy of location for this community, the exhibition describes how the Coors Brewery decided in the early 1950s that steel—the material chosen for selling beer in cans—was seriously flawed for a variety of reasons, including leakage, contaminants, cost, and most importantly, the unpleasant metallic taste it gave to beer. And so in 1959, Coors invented the two-piece aluminum can, revolutionizing the beverage industry. Coors continued to innovate, creating the internal coating, sterile-fill, and printing processes for aluminum cans that are still the industry standard. 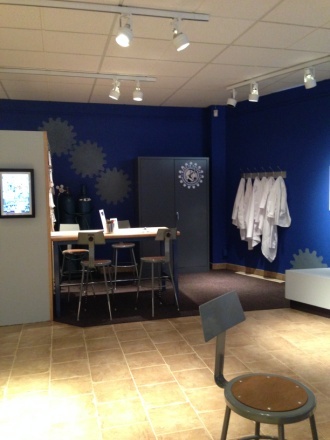 Another view of the Made in Golden exhibition, showing various processes of innovation. Access and proximity to the mountains also brought innovative adventurers to Golden. In 1981, Patrick Smith survived an avalanche in nearby Berthoud Pass, even though he left his specialized shovel (invented by fellow Golden resident Paul Ramer) in his car because it wouldn’t fit in his backpack. In response, he designed a new kind of pack around the dimensions of a Ramer shovel, and the firm Mountainsmith was born. 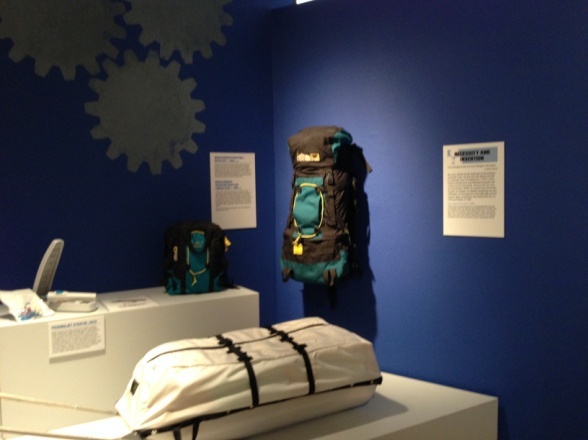 Mountainsmith used a patented delta suspension system, and produced the best selling lumbar pack for close to 10 years. In related gear innovation, climbers and mountaineers alike also flock to the Spyderco knives developed and still produced in Golden, with their trademark holes and pocket clips that make these necessary survival tools easy to carry. Mountainsmith packs on view in Made in Golden. Jolly Ranchers were developed in Golden, as a way for ice cream vendors Bill and Dorothy Harmsen to extend their season into the Colorado winter by making candy with best-selling names like Fire Stix. And with only four companies in the world producing low wattage lasers for commercial use, Golden boasts one of them, Epilog, who turned the industry on its head when it invented the first low-cost, small-format laser engraver. It’s like a printer, except instead of paper, one can print on glass, wood, metal, fabric… even eggs! An Epilog laser-produced metal disk, each visitor’s souvenir from this innovation exhibition. 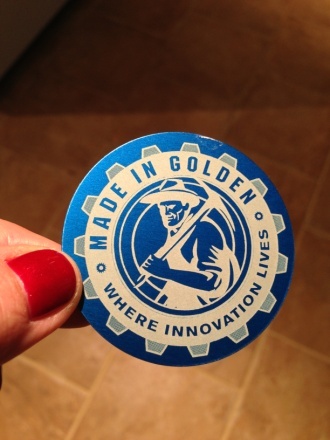 Golden is not the only place to uncover the state’s history of invention. The History Colorado Center (a Smithsonian Affiliate) chronicles innovations in mining, snow sports, and more at its location in downtown Denver. (For example, did you know that the cheeseburger was invented in Denver?) 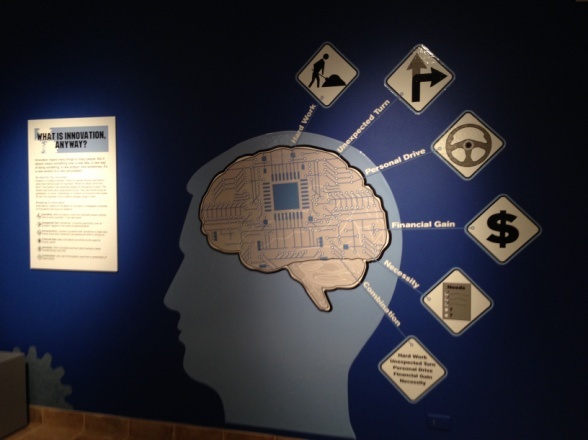 The Lemelson Center’s Places of Invention exhibition already plans to highlight two Colorado stories when it opens in 2015. The Telluride Historical Museum (a Smithsonian Affiliate) will share how the Ames Hydroelectric Generating Plant built in 1891 was the world’s first commercial long distance transmission and use of AC generated power. This breakthrough was critical to operating the silver mines in the often inaccessible terrain of the San Juan mountains of southern Colorado, but also, transformed the industrial capacity of the nation. Fort Collins’ revolutionary inventions in clean energy and socially responsible innovation will be featured as well, showing that Colorado State University, the city, and community businesses actively pursue collaborations that result in local innovations with a global impact. Another view of the Made in Golden exhibition, showing a lab for visitors to devise their own innovative solutions to city problems. Colorado is a gold mine of invention, both historically and into the present day. I’m confident future prospecting trips will uncover even deeper veins of innovation. Any ideas on where else to look?! Please take 2 minutes and give us your feedback on this map at https://www.surveymonkey.com/r/places-of-invention-map-feedback. Thanks! 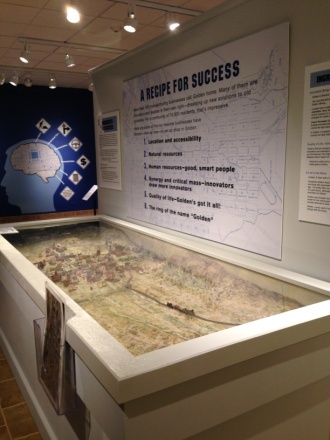 While on a trip through Western Massachusetts, Jennifer was excited to experience the truth of the Lemelson Center’s assertion that, while they have chosen historic and contemporary examples for their exhibition, invention can happen anywhere. Like more famous garages in Silicon Valley that begat Apple and Hewlett Packard, the former 800-square-foot garage in Minneapolis served as a convenient, no-rent location for Palmer Hermundslie and Earl Bakken to found Medtronic in 1949. The "Places of Invention" Affiliates Project is empowering communities across the US to document local invention and innovation. Here's a story from Lowell, MA.